What do you get when you cross a former nurse who has long sultry legs with a detective agency that investigates insurance fraud? You get Pauline Sokol, detective extraordinaire. Pauline Sokol is the creation of author, Lori Avocato who has also worked as a nurse. In her newest addition to the Pauline Sokol mystery series, Nip, Tuck, Dead, the sassy ex-nurse-turned-medical insurance fraud investigator’s latest case goes beyond skin deep when she goes undercover at a plastic surgery spa for the rich and powerful. In her latest case Sokol investigates cosmetic surgery fraud in Newport Rhode Island, the surgical playground for the rich and famous, by assuming the role of a private duty nurse, but what she needs is a suitable patient to attend to. Luckily, her best friend and colorful co-worker “Goldie” is a flamboyant cross dresser who jumps at the chance for a nose job. During her time undercover, Pauline uses her astute nursing powers of observation and her critical thinking skills to escape from the jaws of death, solve a murder case, and put a few shady characters behind bars. It just goes to prove once a nurse, always a nurse. Bravo, Nurse Sokol! This is a great book for those who like a quick read. I finished the book cover-to-cover in two evenings while my husband was busy watching televised football games. 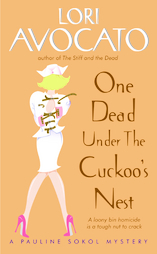 I can’t wait to read Lori’s book, One Dead Under the Cuckoo's Nest. I want to see what kind of trouble she uncovers on a psych unit. You mention the televised football games with just the slightest hint of disdain? 31 bowl games down, one to go. i've always thought that you do not actually read the books you post here. i thought you just sort of discuss stories based on the cover pictures, because they are just pictures you get from the internet, and not actual books that you have. High heels and tight skirt? What kind of uniform is that? Nurse Sokel sounds like a good creation. WOW---the author herself left a comment! That is so neat! Amazing... Lori in your comments! Thanks for the reading suggestion. Wowee! You even got a comment from the author of the book! High five Mother Jones! I know! I know! How sexist of me! Guilty! I think she DOES read those books. :P if she's anything like me, that is! I go through about 3-4 books on average a week (of course errr...ahem, some of those are textbooks as I am studying to become an RN). However, a lot of Star Trek and Agatha Christie, Mary Stewart and Harlequin Romances work their way into my repretoire! I am so thinking these books are right up my alley. I am going to go find them in the bookstore and give them a go. I love the covers on those books, they look fun too. How cool is it the author also chimed in? Hey, Lori, thanks for stopping by. Can I get you to autograph my book? It's Christmas Grand Rounds, Charlie Brown!